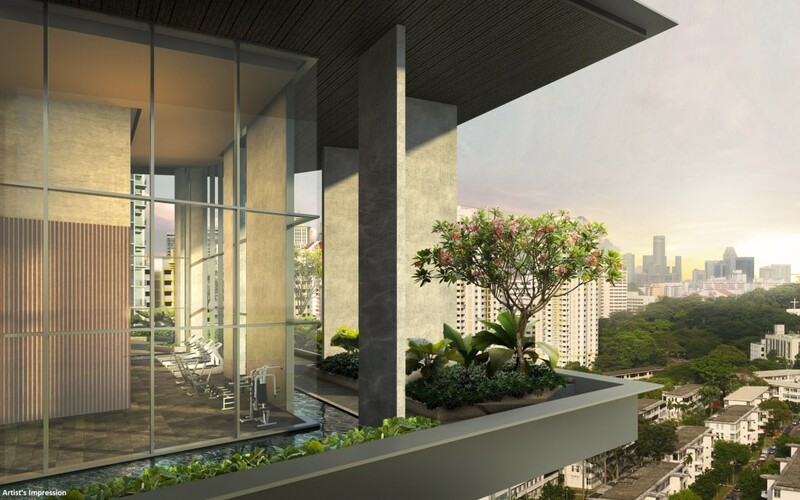 Iconic New Launch in Tiong Bahru from $1,9xx psf! Last 22 units. Selling fast! Register below to view & enjoy special discounts! 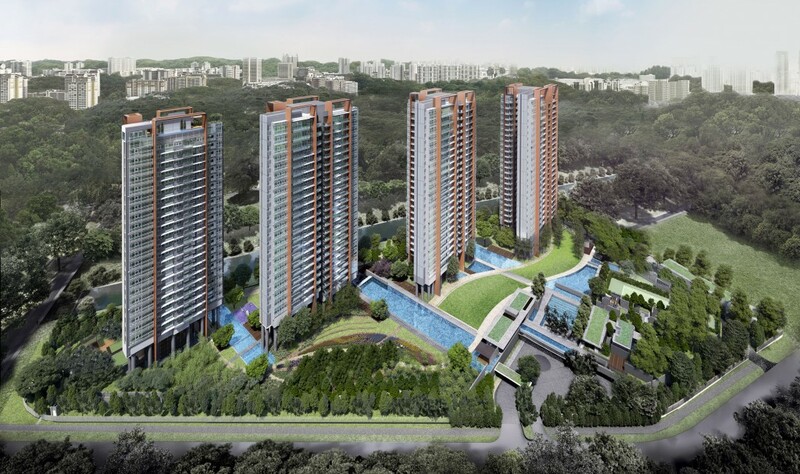 Highline Residences is an up and coming condominium developed by Keppel Land. 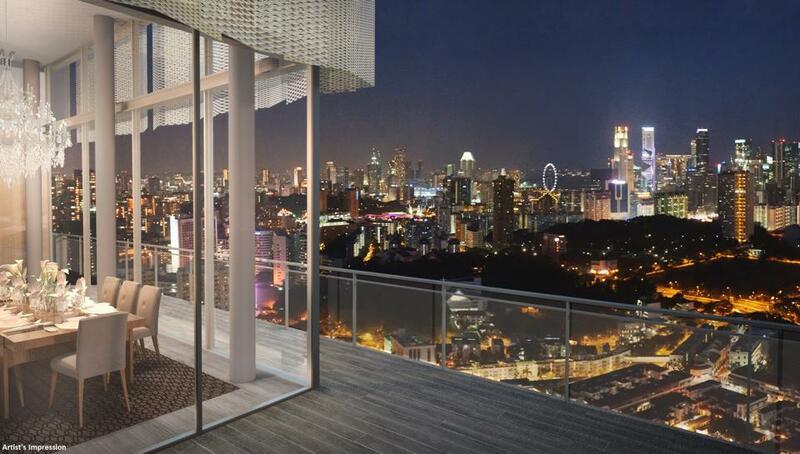 Located at the junction of Tiong Bahru Road and Kim Tian Road, this highly sought after condominium is expected to be completed in mid 2017. 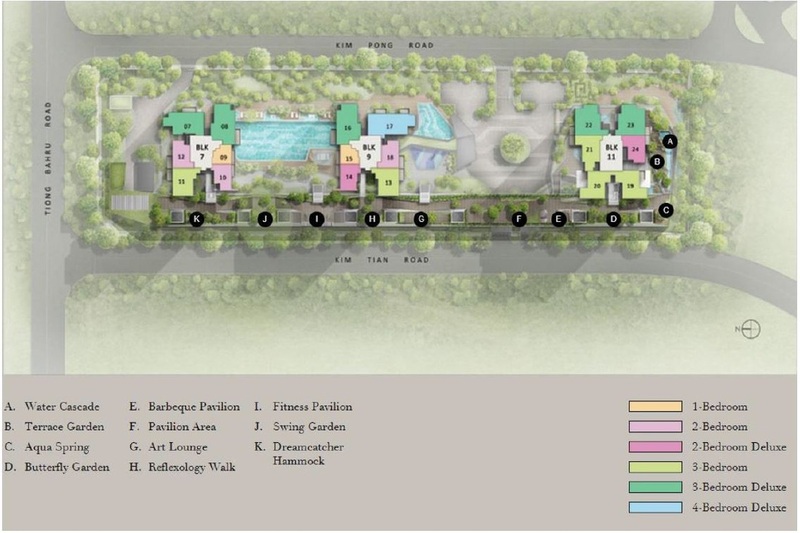 This residential property consists of 500 units of 1-4 bedroom suites coupled with luxurious facilities. Highline Residences suites are built with the finest exterior architecture and sophisticated interior design. Furthermore each luxurious unit comes with a well-equipped kitchen. 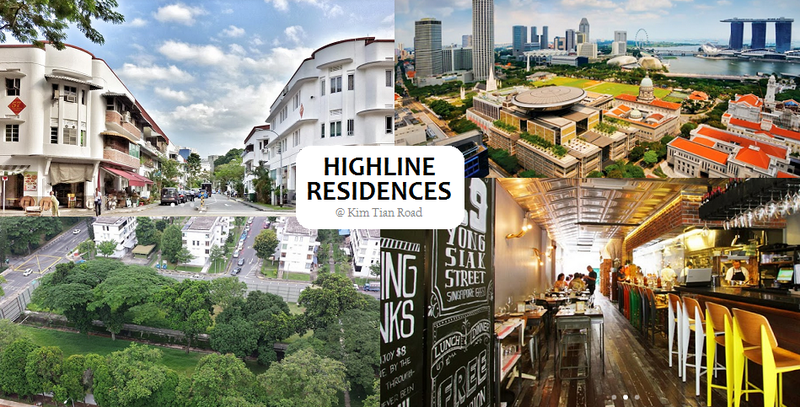 Situated along Kim Tian Road, Highline Residences is only a short walk away to Tiong Bahru MRT Station and upcoming Havelock MRT Station on the Thomson Line. 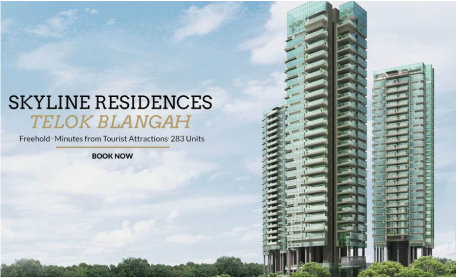 Highline Residences is located in the prime District 03, in a well established mature residential estate, near to city centre and surrounded with a wide ranges of amenities and lifestyle facilities. 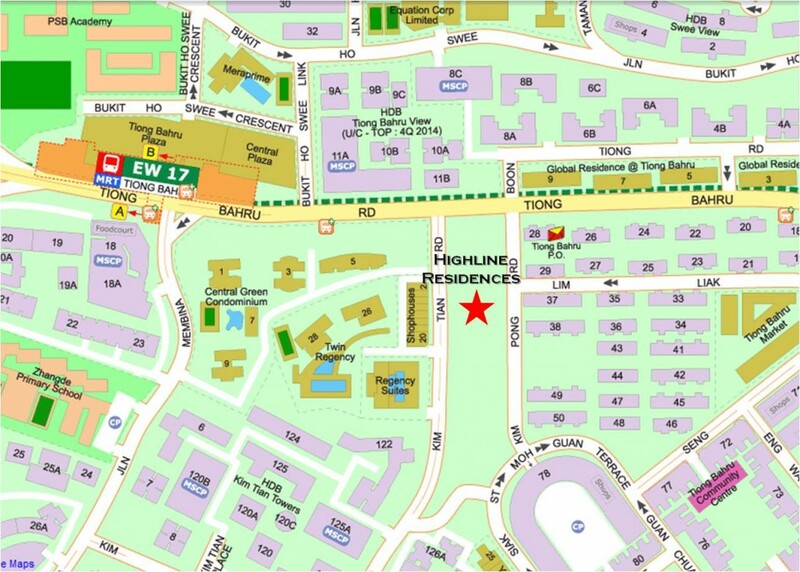 Highline Residences is conveniently located at near Tiong Bahru Plaza and Central Plaza. Besides shopping malls, nature parks such as Tiong Barhu Park, Henderson Park and Telok Blangah Hill Park are within the vicinity. 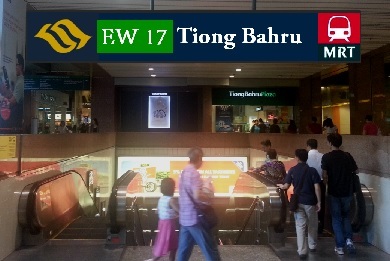 Tiong Bahru Mrt station is just a 5 minutes walk away from the condominium. Hence commuting to Central Business District (CBD) areas, Orchard Road, Keppel Golf Link and Vivocity is convenient and fuss free. For residents with vehicles, Highline Residences is well connected to the CBD area via Central Expressway (CTE) making it a drive that is no longer than 5 minutes. Tiong Bahru is an old charming estate with filled with rich heritage, Art-deco style architecture and small quiet lanes are distinctive details which differs Tiong Bahru from other estates in Singapore that led URA to grant the conservation status to Tiong Bahru estate. 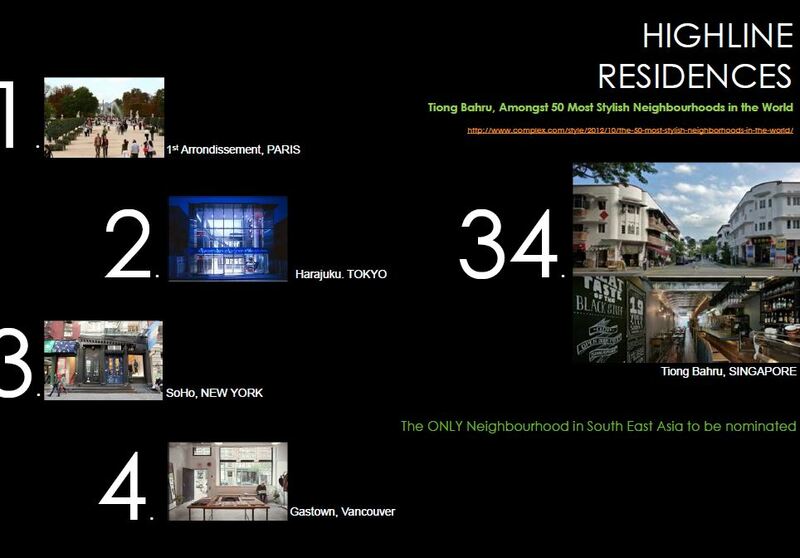 Tiong Bahru is also voted one of the Top 50 Most Stylish Neighourhood in the World by Complex Magazine, alongside with Japan's Harajuku, SOHO in New York City, Le Marais in Paris. 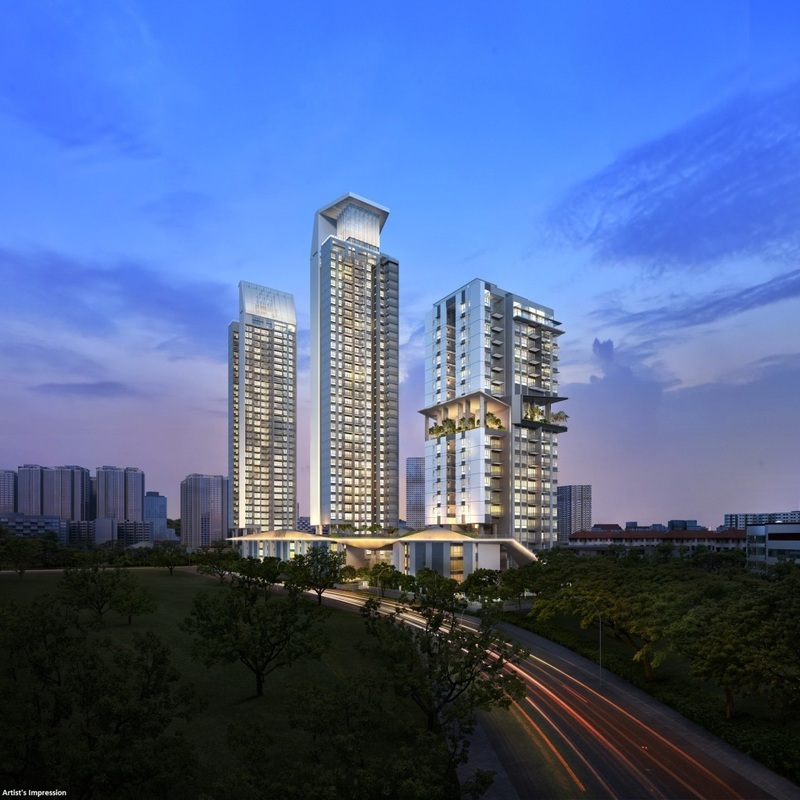 Highline Residences will be made up of 7 blocks of residential units, including a 21-storey block, two 36-storey buildings, and four 4-storey buildings. There will be a total of 500 residential units with a choices of one bedroom to four bedrooms units, ranging from 506 to 1,292 square feet. Each unit will be partially furnished with high-quality finishing and world branded appliances. There are also 6 exclusive penthouse available which sizes from 2,174 square feet. 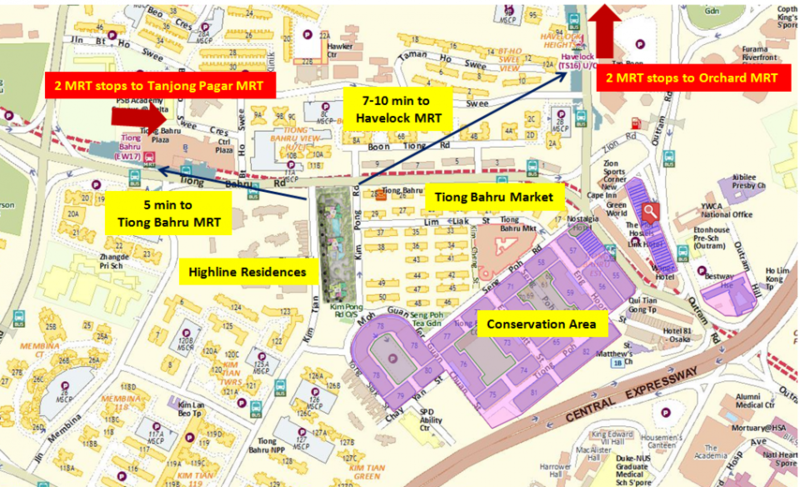 Tiong Bahru MRT Station is less than 200 meters away from the development which will connect the inhabitants to almost all important parts of Singapore. 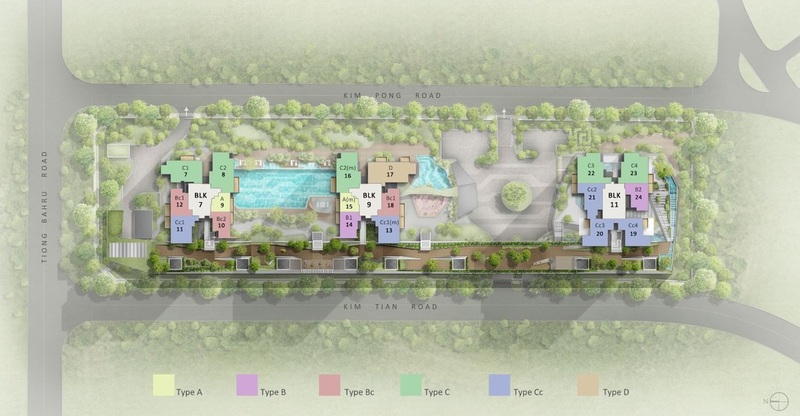 10mins drive away from the attractive development and CBDs. Different amenities around it. Like: Great World City, River Valley, Marina Financial Centre, Shenton Way area, Conservation Area etc. Reputed communal, social, recreational facilities, malls and shops are also within short distance. 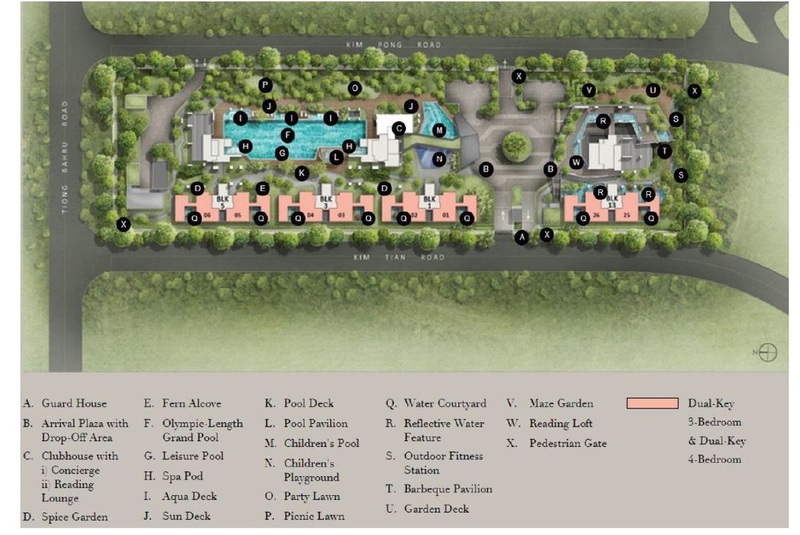 The residential development is located in a mature estate. Luckily, it is surrounded by a wide variety of amenities within short distance. Highline Residences is close proximity to several business centres, transport hubs,reputable schools, shopping malls, and lifestyle attractions. Given by the development desirable location , strong demand will be expected from home owners who aspire to own a top quality home in the city fringe. 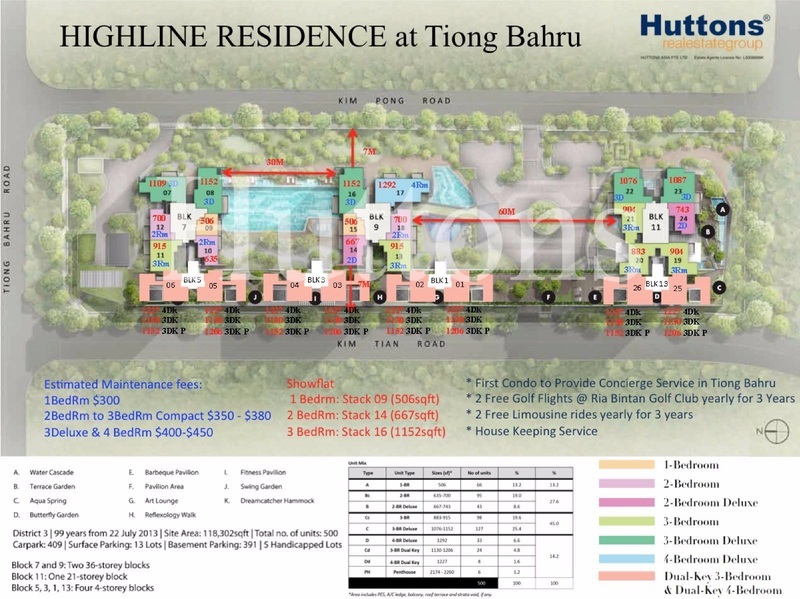 For investors looking for passive rental income, a Tiong Bahru address will definitely interest a lot of tenants from One North, Science Park, National University Of Singapore and those working in Central Business District and Marina Bay Financial Centre. 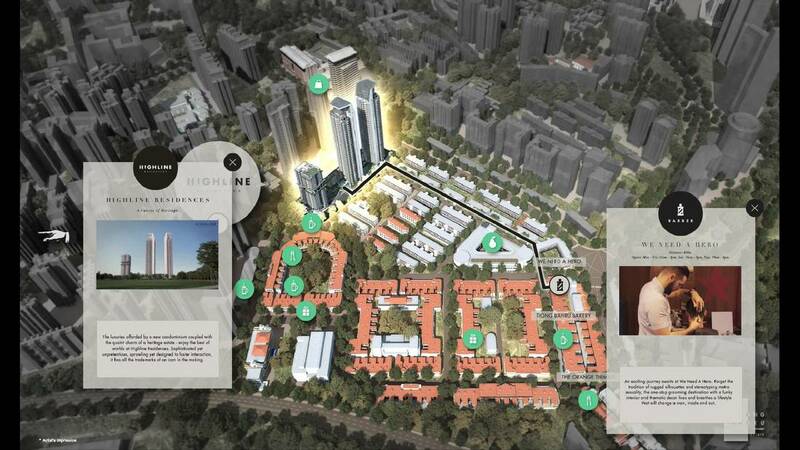 Highline Residences will be your dream home due to the close proximity to City, CBD, Orchard Road, One North with it's well connectivity of major expressways (CTE, AYE, ECP) and MRT Stations (Tiong Bahru MRT, future Havelock MRT, 2 stops away from Orchard MRT). 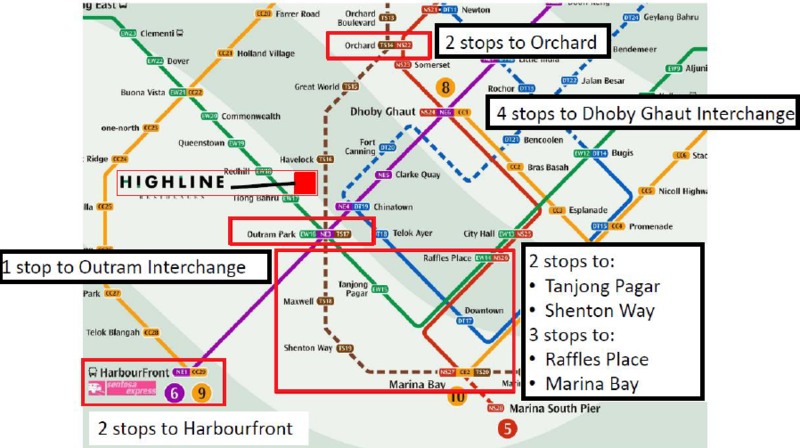 Well connected bus networks also provides easy access to other parts of Singapore island. 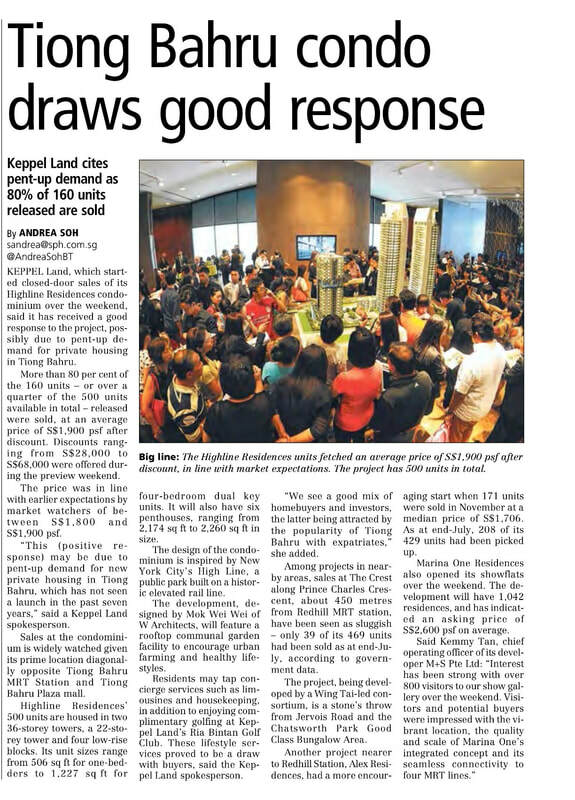 Strong Rental Demand - Tenants from One North, Science Park, National University of Singapore and those working in Central Business District (CBD), Tanjong Pagar and Marina Bay Financial Centre (MBFC). This residential property consists of 500 units of 1-4 bedroom suites coupled with luxurious facilities. Highline Residences suites are built with the finest exterior architecture and sophisticated interior design. Furthermore each luxurious unit comes with a well-equipped kitchen. Residents of this condominium can get to indulge themselves in a swimming pool, Jacuzzi, reading room, function room, Yoga room, indoor gym, clubhouse as well as hydrotherapy beds. There is also a playground and paddling pool for children as well as a barbeque pit making it an ideal home for families. 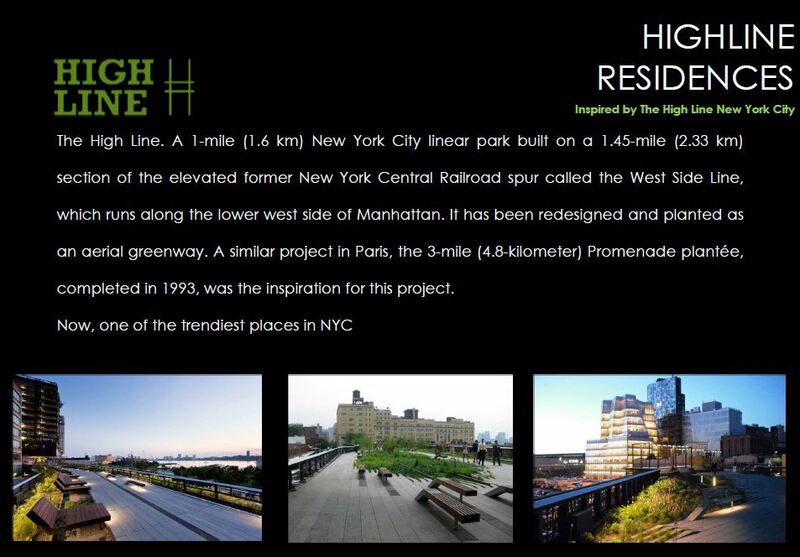 The High Line is a public park in New York City built on a 1.45-mile-long elevated rail structure running from Gansevoort Street to West 34th Street on Manhanttan’s West Side. The High Line elevated freight rail line, was in operation from 1934 to 1980. It carried meat to the meatpacking district, agricultural goods to the factories and warehouses of the industrial West Side, and also mails to the Post Office.